He just keeps looking better by the week. He followed up last week’s sharp work with another brilliant move, breezing a half in a bullet :46 2/5, out 5 furlongs in :59 2/5 and did it under no urging on a loose rein down the stretch. I still cannot find a flaw in him, and it’s kind of scary how much he’s improved and how he carries his form, After running mostly double-digit Thoro-Graph numbers at 2, he has now run three straight races with a figure of “1” or lower, which is pretty remarkable. The only question now is, can he keep up that kind of pace? That is why I said last week, don’t be alarmed if he regresses a bit in the Santa Anita Derby and doesn’t blow his opponents away. The main thing is not to give him too hard a race. It’s great to win the Santa Anita Derby, but it’s not the ultimate goal. Look at what Vicar’s in Trouble did in the Louisiana Derby after losing the Risen Star, finishing a well-beaten third after two monster performances. Candy Boy and Hoppertunity are two tough opponents, and it’ll be interesting to see how he handles the step up in competition. If he beats them the same way he’s been beating everyone else, it could either be too much too soon or he’s a freak. Worked 5 furlongs in 1:01 1/5 for his likely start in the Santa Anita Derby. There’s no worry about points, so all be needs basically is a good competitive performance. He’s already crammed four races in this year alone and without a race at 2. So it’s all come fast for him. He is improving steadily with each start and now it’s all about maintaining what’s there and let him progress naturally without knocking him out chasing California Chrome and Candy Boy. It’s rare to see a horse with no races at 2 squeeze in five races before the Derby. But he’s come along quickly and looks like the kind of horse who can handle it and keep moving forward as long as he doesn’t bust a gut on Saturday. You could not have written a more perfect script for a horse in his position. With so little experience and so much history against him, he needed a hard-fought gut check and he passed with flying colors, showing more professionalism and adaptability than most horses would have in the same situation. This is a colt who was considered something very special from day one by Randy Gullatt, who picked him out at the sale. He was so impressed with him, he wound buying his dam as well before he even started. At the start of the Florida Derby, Castellano was trying to ease outside Wildcat Red when General a Rod came in and bumped him so hard it knocked him inside Wildcat Red and put him down on the rail, which is not where Castellano wanted to be. Having already asked the horse for speed, he now had to step on the brake to prevent him from running up on Wildcat Red’s heels. Constitution, a headstrong horse in general, apparently was confused and frustrated by the sudden restraint and kept throwing his head up, fighting his rider. Many horses would have sulked in this situation, but he eventually settled right down like an old pro and just bided his time, while being trapped by General a Rod. When the rail opened up, he shot through and engaged the gritty and far more experienced Wildcat Red, who had been in a number of stretch battles already and never backed down from any of them. For him to outgame such a tough, seasoned horse having had only two easy victories under him showed just how special a horse he is. If anyone can shred the history books and put an end to racing’s oldest curse (Apollo) it is this colt. He couldn’t be sharper, breezing 5 furlongs in a bullet 1:00 4/5, with a powerful final quarter in :23 1/5, out 6 furlongs in 1:13. Asmussen has attempted to get back to business as normal through all the turmoil and saddled the brilliant Untapable to another sensational victory in the Fair Grounds Oaks for Tapiture’s owner Ron Winchell, who said his horses would remain with Asmussen. The main thing with Tapiture now is to show any kind of sign in the Arkansas Derby that he will want to stretch out that extra furlong in the Derby. We know how talented and tough he is, and there is no doubt he will have no problem getting the 1 1/8 miles. He will have some new competition, and how he handles them should tell us where he’s at in regard to the Kentucky Derby. All signs point to a big effort on April 12. This is another horse I’ve found myself liking the more I see of him. His five-furlong work in 1:00 2/5 at Calder was as impressive as it gets. I love the way he handled that surface, especially the way he changed leads and dropped his head and shoulder in the final sixteenth and just glided past the wire before galloping out strongly. Not needing any points, the Calder Derby looks like it should be an excellent prep for him, and that surface and Tampa’s surface should give him a lot of bottom. But when you take an easier route like this you better deliver and at least show something to suggest you’ll be able to handle the top horses at Churchill Downs. Calder will be his sixth racetrack, and he’s already run on four different surfaces – dirt, slop, grass, and Polytrack, so he’s pretty much seen it all. If Commanding Curve, a fast-closing third in the Louisiana Derby, can make it into the Derby field with his 20 points it will give West Point Thoroughbreds a pretty powerful one-two punch. An experienced pro, he pulled a fast one turning for home, appearing to crossfire, causing his stride to become discombobulated and pretty much losing his action. You can see his back legs out of sync with his front legs, as he ducked sharply to the inside, actually bouncing off the rail. Stuck on his left lead down the stretch and totally out of rhythm, he did finally switch to his right lead and level off around the sixteenth pole and galloped out strong. And this came after getting bumped around and having to steady briefly approaching the half-mile pole. So that brings up the question of what to make of all this. To be honest, I have no idea. This is not what you want to see the race before the Kentucky Derby, but fortunately he has enough of a foundation and has shown enough professionalism to suggest that this was some kind of fluke; that he just became unbalanced and it will serve as a useful prep for the Derby. He also was closer up than usual, and a big positive before all the theatrics occurred was the turn of foot he showed on the turn pouncing on Vicar’s in Trouble in a flash. But then he lost his momentum. It looked as if the winner had the better of him turning for home, but he may have already been starting to lose his action. Just another puzzler on this bizarre Derby trail. He’s another who I have no clue what to do with. He was caught between the proverbial rock and a hard place, having to chase Wildcat Red while showing restraint by not going toe to toe with him again, with Cairo Prince lurking behind. If he hadn’t come in and bumped Constitution to the inside, putting him behind Wildcat Red, the entire race scenario could have changed. He ran one paced the whole way, while shying from two right-handed whips in the stretch, and I can’t help but think back to his maiden race at Keeneland, in which he came from ninth and exploded on the turn to win going away, again shying from a right-handed whip. The addition of blinkers apparently sharpened his speed, but I have to wonder if it made him a better horse, taking away that explosive move. I also can’t help but wonder if he would be more inclined to pass horses if he could see them better. It wouldn’t be surprising to see Maker open his blinkers a little, but I’m merely thinking aloud and certainly am not audacious enough to suggest such a thing. Maker knows him a lot better than I do. It’s just that I keep seeing him run the same race over and over and also have to wonder if that kind of pace-pressuring running style can win him the Kentucky Derby. If the Derby has the kind of speed it appears it will have, that would possibly allow Rosario to get him back in the second tier and try to duplicate that move he made at Keeneland. That is the kind of move that wins Kentucky Derbys. He has the pedigree to go 1 1/4 miles, and if you see him train up to the race with slower works and a strong finish and gallop out, watch out. He continued his trend of mile works, this time breezing in a solid 1:44 at Palm Meadows. The form of the Gotham took a bit of a hit when third-place finisher, In Trouble, beaten in a three-horse photo, could do no better than a well-beaten fourth in the Louisiana Derby, beaten 8 3/4 lengths and subsequently disqualified to fifth. Now comes a new challenge from the potentially freaky Social Inclusion. And of course there is his Big Apple antagonist Uncle Sigh. With all the talk about undefeated Social Inclusion and Constitution and Bayern, people forget this colt is undefeated in five starts and has proven his brilliance and his tenacity and will to win. Despite his flawless record, racing’s frequent flyer still is pretty much under the radar, but he sure won’t be if he can continue his unbeaten streak in the Wood Memorial. Come to think of it he’s been on the radar screen literally more times than any 3-year-old in memory as he hops back and forth from New York to Florida. The only reason I lowered him this much is because he now needs a major break to get in the Derby. At first, his race was a disappointment, especially since he now has to sweat it out just getting into the Derby; the consequences of a two-race campaign, nine-week layoff, and so few points going into the final prep. But I actually think he was striding out well in the stretch. He just ran like a short horse. But this might not be as bad a race as it first seemed. He made a strong move nearing the head of the stretch and looked ready to pounce on the leaders, but just flattened out turning into the stretch and came up empty. Still, when you break it down, it was very humid day, he was coming off a layoff, and his fractions of :24 3/5, :24, :23 4/5, :24, and :12 4/5 were actually pretty good, other than his final eighth when he apparently began to feel the effects of the layoff. So, if you give him a pass for that final eighth, which really wasn’t all that bad, his fractions and the way he was striding out indicate this actually may have been a decent prep for him. But was it enough to get him ready to win at 1 1/4 miles, and more important, was it enough to get him in the Derby? Remember, in all that time off he never worked farther than 5 furlongs. His pedigree is OK, but it doesn’t exactly shout 10 furlongs. I believe he can get it in a peak performance, but things will have to go perfectly from this point on in his training and in the distribution of points. His connections can do nothing now but hope the horses above him rake in all the points or do what Palace Malice did last year and run back in two weeks, depending on how tired he was after the race. That doesn’t seem too likely. Last week I said to look out for a big bounce back effort after a regression in the Risen Star. Well, actually, from a numbers standpoint, I was wrong, as his Thoro-Graph figure actually was two points faster in losing the Risen Star than it was romping in the LeComte. 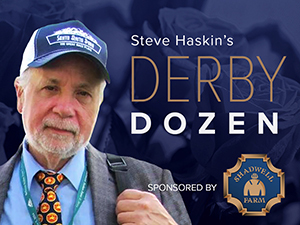 Give a big assist for his Louisiana Derby victory to Rose Napravnik, who took advantage of the track and the post and outran all the pure speed horses on her outside, setting an easy pace and coasting to 3 1/2-length score. But one must note the :13 3/5 final eighth and :38 3/5 final three-eighths. And the final time of 1:50 3/5 was nearly two full seconds slower than the New Orleans Handicap. Earlier on the card, Untapable romped by 7 3/4 lengths under a hand ride in the 1 1/16-mile Fair Grounds Oaks. If you added a slow :07 seconds to her final time, she still wins the Louisiana Derby by three lengths. But of course we know you can’t always compute things like that, and there is no denying Vicar’s in Trouble is a brilliant and talented colt who likely is a better horse coming from off the pace. His pedigree is stronger than people think, and he’s a horse you can never count out. Breezed six furlongs in 1:15 for the Wood Memorial. He was caught in fractions :38 1/5 and :50 3/5, coming home his last quarter in :24 2/5 and galloping out a mile in 1:42 4/5. That should set him up beautifully for Round 3 against Samraat. Just once it would be good to see what this horse is capable of doing racing outside Samraat instead of being on the inside and pretty much committed to the lead or close to it. As I’ve been saying, he does have a strong female family, and it’s time he’s able to use it and see just how ratable he is and if he can settle several lengths off the lead. This year’s Derby has the potential to be a barn burner on and near the front end and it would benefit any horse if they can keep out of the fire. Well, one down and two to go. The first of racing’s three undefeated two-race wonders proved his worth in the Florida Derby and now it is SOCIAL INCLUSION’S turn in the Wood Memorial and BAYERN’S in the Arkansas Derby. Social Inclusion certainly isn’t your typical 3-year-old, with his owner turning down huge offers for the horse (reportedly one for $ 8 million), deciding to establish his value in the Wood. And then there was the colt having three works in the span of a week – two half-mile drills sandwiched around a three-furlong work. His most recent work was a sharp :46 4/5 half, out in :59 3/5. So, super freak or no super freak? We’ll find out on Saturday. Bayern worked five furlongs in 1:00 4/5, after which Bob Baffert gave the go ahead for the Arkansas Derby.. There were so many horses I wanted to put in the Top 12, but none of the horses on there ran bad enough to drop. As it is I had to drop No. 12, RIDE ON CURLIN, to make room for Constitution and I hated doing that because he is another I’m starting to feel is a live longshot. He has another week before the Arkansas Derby, and I’m pretty sure he’ll be back next week after the Wood Memorial and Santa Anita Derby. He turned in a sharp 1:00 3/5 breeze to the seven-eighths pole, galloping out six furlongs in a very strong 1:13 2/5. He needs to get off the lead or anywhere near the lead and go back to his running style from the Champagne Stakes. I love Jon Court on him, a veteran rider who has had success in the Arkansas Derby. Not many are talking up this colt, but watch out for him. Now is when you can get value on him, and he could be a smart bet in the exotics. I discuss him in more detail in this week’s One for the Roses podcast. I also wanted to put the gutsy WILDCAT RED on there, mainly because he’s a horse you have to admire and who deserves the recognition. Although this may sound odd, I think Wildcat Red may have set too slow a pace in the Florida Derby. With his natural speed and the bottom he’d built up, he could have just tried to run these horses off their feet instead of lollygagging through a :24 quarter and :48 half. That allowed all the major threats in the race to remain within striking range and make a run at him. It especially helped the lightly raced unproven Constitution. There were no real deep closing threats in here, so there was no need to be afraid of a top proven stakes horse flying late. I realize that sounds like nitpicking considering he was only beaten a neck, but if you’re going to set slow fractions like that and allow horses to breathe down your neck, you don’t want to open the rail. But in John Velazquez’ defense, he might haven been concentrating more on General a Rod on his outside than Constitution, considering their history together. Give the colt credit for another gutsy performance. He may just have been beaten by a better horse. I realize there’s a good chance some of the horses who are Knocking at the Door will come back to haunt me for not having them on, mainly my two big sleepers, CONQUEST TITAN and WICKED STRONG, both of whom could be gotten now at a good price in Vegas. I loved both these horses way back in January and I think there’s a good chance both have been playing possum and are ready to spring back to life in the Arkansas Derby and the Wood Memorial. I hope to get Conquest Titan back on next week if space permits. When this horse is ridden properly I believe he can run with anyone, and you can bet the mortgage he’ll be ridden properly in the Arkansas Derby, which means coming from way out of it. And who better to come from way out of it than his new pilot Calvin Borel. He could be a live longshot. Wicked Strong could be one of those typical Wood Memorial horses we see every year who comes flying late to be second and establish themselves as a serious Derby contender. We don't know what to expect after his Florida campaign, but if that same horse we saw in the Remsen shows up on Saturday, you never know. He could even win the whole thing....if. To confuse the Derby picture even more is the alien ship that fell out of the sky named TOAST OF NEW YORK, a U.S.-bred colt who ran roughshod over a talented field of 3-year-olds, including several proven older horses from the Southern Hemisphere, in the 1 3/16-mile UAE Derby. It was the third straight daylight victory over a synthetic surface for the English-bred, who had won two races at Wolverhampton by a combined 28 lengths before his dominating victory in Dubai, defeating the likes of Breeders’ Cup Juvenile Turf runner-up Giovanni Boldini; the Australian-bred UAE 2,000 Guineas winner Long John; the grade I-winning Argentine-bred Cooptado; and Asmar and Emirates Flyer, the one-two finishers of the Al Bastakiya, second leg of the UAE Triple Crown. He is nominated to the Triple Crown and his connections did not rule out the possibility of coming to Kentucky. Working for Saturday’s Calder Derby over the track were CASIGUAPO, who went six furlongs in 1:13 3/5, and GIANCARLO, who breezed five furlongs in 1:03. Casiguapo has competed in some top company during his career and is one of those horses who is capable of popping a big one at any time. VINCEREMOS, who is owned by the same partners who have Constitution – Twin Creeks Racing and WinStar Farm – showed his sharpness for the Blue Grass Stakes by breezing a half in a bullet :47 2/5 in company with his rival, the enigmatic HARPOON, who goes in the Wood Memorial. If the big three are all going to be beaten in the Santa Anita Derby, the perpetrator could be the lightly raced SCHOOLOFHARDROCKS, who drilled six furlongs in 1:12 4/5. Also working sharply in California was stakes-placed KRISTO, who went six furlongs in 1:12 2/5. Tuning up for a possible start in the Wood Memorial was Jerome winner NOBLE MOON, who breezed a mile in 1:45 2/5 over the Belmont training track. It seems like ages ago that this horse last ran. One-time Derby candidate MEXIKOMA returned to the work tab, breezing three panels in :39. It was interesting to see that COMMISSIONER is coming right back in the Arkansas Derby after stumbling at the start on the Sunland Derby, blowing a shoe, but still running well enough to close for third. Giving the son of A.P. Indy another race before the Derby actually is move that can win Kentucky Derbys. He's a big, strong, handsome colt. If he's ready for anther race, run him. Here is a question to ponder regarding the point system: who would you rather see in the Derby, a horse who wins a graded stakes on Polytrack but has shown he’s inferior on the dirt or a horse like COMMANDING CURVE, who runs a fast-closing third in the Louisiana Derby after a troubled start, but is questionable at best to get in the Kentucky Derby because of lack of points.? That’s not to say the synthetic specialists did not earn their way into the Derby. The races were out there and they took advantage of it. The synthetic races may not attract the best 3-year-olds, but they usually are competitive events with large fields. Situations like that of Commanding Curve are always going to come up when you’re dealing with a late-developing horse whose Derby status depends on his final prep. But it is something to think about. We’ll see what happens with Commanding Curve, as well as Cairo Prince, who definitely belongs in the Kentucky Derby, but also is flirting with being shut out. He was, after all, the consensus favorite for the Derby on Friday and in danger of getting left out of the race on Sunday. That also is something to think about when planning a horse’s Derby campaign, knowing the risk involved if one little thing does not go according to plan. The trainers are doing what they feel is right for their horse, but sometimes it just doesn’t work out. Let’s just hope both these colts wind up in the Derby field.